When traveling to Koh Lipe Thailand, you’ll more than likely find yourself gazing off into the Andaman sea at the nearby islands. Odds are you’ll be looking over at Koh Adang. Which is one of the closest islands to Koh Lipe and one you should definitely go explore. If you are looking for the best view of Koh Lipe it’s a must to hike up to the Koh Adang viewpoint. We’ve put together this Koh Adang guide with everything you need to know and the best things to do on Koh Adang. Koh Adang is part of the Tarutao National Marine Park located in Southern Thailand in the Andaman Sea. It is easily reached from Koh Lipe. Koh Adang is the second largest island in the Tarutao National Marine Park, it spans 6 km long and 5 km wide. Koh Adang is also sometimes written Ko Adang and in Thai: เกาะอาดัง. There is only one option to get to Koh Adang and that is by boat. You can either kayak to Koh Adang or take a taxi boat. Both options are super cheap. We hired a taxi boat right on Sunrise Beach at the taxi stand for 100 baht per person ($3 USD). The price didn’t seem to matter if there was 2 people or 4 people it is a fixed price per person. If you have a local Thai SIM card get the number of the boat captain and call him when you are ready to be picked up to go back to Koh Lipe. This is what we did and our driver was at Koh Adang within 10 minutes of calling him. Another option to Koh Adang is to kayak there from Koh Lipe. Our hotel Salisa Resort rented kayaks for the day for only 400 baht ($12 USD) or 150 baht an hour ($5). Local Thai’s will tell you it’s too far to kayak, but it’s not if you have kayaked before you will be fine. We would not suggest swimming there, the islands are much farther apart than they appear. Not to mention, how unsafe it would be with all the boat traffic going between Koh Adang and Koh Lipe. Koh Adang is part of the Tarutao National Marine Park which costs 200 baht ($6 USD) for foreigners and 40 baht for Thai’s. On our last visit, it was required to buy a National Park ticket on arrival at the ferry dock before taking a longtail boat to Koh Lipe (same ticket works on Koh Adang). We were informed the National Park ticket is valid for 7 days, we stayed two weeks in Koh Lipe and never had an issue. Make sure to keep your ticket and take it with you to Koh Adang and on program 1 & program 2 trips from Koh Lipe. There are several ranger stations that may check your ticket. On our visits to Adang, we were never asked to show our tickets, but it’s best to bring them where ever you go outside of Koh Lipe. The islands of Koh Rawi and Koh Rok Roy stamped the back of our ticket with the date when we visited them on a day trip. Koh Hin Ngam ripped off the detachable part of the ticket. So it is possible if the first stamp is more than a week old you’d have to buy another Tarutao National Marine Park ticket. If you don’t have your ticket you’ll have to buy another one costing another 200 baht. For the best view of Koh Lipe head up to Koh Adang viewpoint #3. There are actually 3 viewpoints on Koh Adang with the third one having the best view of Koh Lipe. The hike is not paved and involves some ropes, uneven surfaces, and can be slippery & muddy if it has recently rained. The path isn’t well marked, several of the “path markers” had fallen down or were simply just spray painted yellow arrows on trees. Keep your eyes open for markers and remember the way you came so when heading back down you don’t take a wrong turn. We had a hard time finding the start of the path. After the ranger station, go towards the restaurant, with the restaurant on your right keep going straight a little and you should see a sign to the left. The hike starts off with “steps” leading you up into the jungle. If you think this part is tough, it will get tougher. We never saw an official sign marking viewpoint #1 but we assume it would be somewhere around the large set of rocks. After about 30 minutes you should reach viewpoint #2 which is well marked, and the view is pretty awesome. We spent 30 minutes at viewpoint #2 taking pictures and a break before continuing. It takes about 45 minutes to make it all the way up to the third Koh Adang viewpoint. Make sure to bring at least a liter of water per person, they sell it at the restaurant for only 30 baht for a 1.5-liter bottle. Try and hike early in the morning before the midday heat is in full effect. Don’t forget to put on sunscreen and bug spray. Bring a dry bag just in case it rains, we got caught at viewpoint 3 in a rainstorm for an hour. When we got back to Koh Lipe we were told it never rained there. You don’t need hiking shoes, Adam hiked in regular athletic shoes and Hannah in her Havaianas sandals. Overall the hike is worth the great views at viewpoint #3. It’s an easy trip from Koh Lipe and one of the top things to do in and around Koh Lipe. There are several waterfalls on Koh Adang with Pirate’s waterfall being the most easily accessed and commonly visited. Once again the start of the trail was VERY hard to find. Ask the ranger to point you in the right direction and try and get as many details from him as possible. The trailhead is only marked by a fallen sign and the opening to the trail is small. Look for the black pipes which you will follow just about the entire hike. When standing on the floating pier looking at the island, the trail start is to the left, about halfway between the pier and rocky end of the beach. After walking on the beach for several minutes, look for a small clearing up into the Thai jungle and possible a spray painted tree or arrow. We had to use the tree roots to help boost us up to the start of the trail. There were several times on the path where it looked like a dead-end, but we kept going. We only passed 2 other tourists on our hike and they gave up halfway, very few people attempt this hike, let alone make it to Pirate’s Waterfall. We made it and here are more details on how to reach the falls. There is only a short section we deviated from the black pipes to walk on the right side along the path of the river while the pipes run over the river. This is the section where there are some very small “waterfalls”. We kept the pipes in sight and followed along a makeshift path that followed the water for around 100-150 meters. From there we crossed the river and again met back up with the black pipes. Once you reach a set of very large boulders in or near to the path of the river you are almost there. There are a few ropes to make your way up to the final few meters before the falls. Use the ropes with caution they were in (December 2016) only tied to the loose roots of a tree. They helped me up but could have been dangerous if they broke while I was climbing. There is only one large boulder that is at about 6-7 ft (2m) that would have been tough to get up without a rope. This hike is much more difficult and less marked than the viewpoint hike. Other waterfalls are supposedly accessible from other parts of the island. Talk with locals on Koh Lipe and see if they can arrange a longtail boat to take you to that part of the island. We were unable to hike to other waterfalls on Koh Adang as information was hard to find. The reward for your efforts searching for the waterfall and a decent set of falls standing maybe 20-25ft (7m) tall. It’s possible there was more to see further ahead but I did not venture past this set of falls. I did not see any path that continued up around the falls. Notice the pipes all the way to the falls, helpful, but not the best in photos! The Viewpoint hike and Waterfall hike are the most popular things to do on the island of Koh Adang, but there are tons of things to do on Koh Adang. People that love the outdoors and want a quieter Thailand vacation could easily spend several days on the island. We took a longtail boat over to the island three times from Koh Lipe. Here are some of our favorite things to do on Koh Adang. There are several dive sites right off of Koh Adang, the two main dive sites on Koh Adang that several dive shops head to are Nursery Bay and Hin Yai/Big Rocks. We dove with Adang Sea Divers who had Koh Adang diving scheduled. Nursery Bay is a shallow dive (1m-15m) and is often used as a dive site those getting their open water certificate. Often spotted is; stingrays, moray eels, hard corals, barracuda, and several other reef fish. Hin Yai/Big Rocks dive site (5m-30m) can have very strong currents and often a fast drift dive. Dive highlights include clown triggerfish, emperor angelfish, and nurse sharks. A tall narrow set of falls runs off a steep cliff in a valley in the middle of the island call Kinaree Waterfall. The falls can be seen when approaching viewpoint #3 on the Koh Adang viewpoint hike (pictured from this point). Some locals said it is possible to hike to this set of falls as well, but we did not make the trip. If you spend the day on the island make sure to bring your own snorkel gear or rent some from the restaurant. There is plenty of sea life right off the shore. Koh Lipe day trips program 1 and program A spend some time snorkeling at Koh Adang. You’ll be shocked how many tourists don’t head over to Koh Adang. Right in front of the ranger station, there is a gorgeous huge white sand beach, on our visit, there were 3 other tourists there. If you are looking for a private beach for yourself you won’t have to look too far, just have your captain drive around the island there will be plenty available. It’s an epic place to spend the day if you’re on your honeymoon in Thailand. Have a longtail boat bring you to the north end of Koh Adang to the black sand beach. Sure white sand beaches are gorgeous but so are black sand beaches. Koh Adang is one of the few islands in the Tarutao National Marine Park where you can step foot on to explore and even spend the night. There are two types of accommodation on Koh Adang, Bungalows or camping. The bungalows looked really nice, we were shocked as they are only 600 baht a night for two people. The chalets came with a fan and a private bathroom. You can book the chalets online here. Advance bookings can only be made on the National Park Service website. At the time writing this, the price online offered a discount for December 2016 dates therefore 2 nights was only 840baht ($23 USD). If they happen to be booked there are several of Koh Lipe hotels to spend the night at. For those looking to hike Koh Adang viewpoint stop into the restaurant before or after to buy a large water for only 30 baht. The prices were comparable to 7-eleven on Koh Lipe. If you are spending a few nights on Adang it would probably be best to purchase a few snacks on Koh Lipe. When you first get to Adang it’s best to stop at the ranger station and check out the maps. They didn’t have any maps of the island for us to take, so we took a picture of the one in the ranger station as a reference. The staff onsite spoke some English and were able to guide us in the right direction to start the hike up to the Koh Adang viewpoint. They did have a pamphlet on Tarutao National Park that was in English and Thai, but it was only information and no maps. There is a public bathroom and shower next to the ranger station. The chalets have their own private bathrooms, but the campers and those on day trips can use the public bathroom. We use AIS and had 4G wireless service during our entire hike up to the viewpoint and to Pirate’s Waterfall. There is no wifi available at the restaurant or in the bungalows. If you plan on spending a few nights on the island buy a data plan and hotspot to your computer. I topped up 3GB good for 24 hours for only 49 baht with AIS. Hopefully, we convinced you to jump on a boat and go explore Koh Adang. There are so many amazing islands in Thailand. I have reservations for Koh Lipe & Adang Island in Jan 2020. I am not a real strong swimmer but plan on doing a lot of snorkeling. Do people wear life jackets when snorkeling these islands? Aww we love to hear that and great to hear we have been a good resource for you while planning a trip to Koh Lipe & Koh Adang. Most companies that run snorkeling tours will require you to wear a lifejacket but if you snorkel from the beach you aren’t required. If you aren’t a strong swimmer we would suggest wearing a lifejacket you’ll be more comfortable in the water. Safe trip to Koh Lipe! Thank you for this perfectly detailed article! Is Thérè a place to leave our Beach bags while we go on the hikes? If you are just coming for the day there isn’t really any places for your bags. However, you can rent a room here on Koh Adang if you wanted to stay – they should be around $20 per night. Hello Hannah and Adam. I will be in Koh Adang (Adang Island Resort) in February. Can you tell me if it is easy to get to Koh Lipe early in the morning to catch a Ferry (9 am) to Koh Lanta? Can we get a boat taxi early? I would just prearrange it the day before. 9 am isn’t that early either. What hotel in Koh Adang are you staying at? can tell you tell me where we have to pay the bungalow at Ko Adang. We already booked three nights but don‘t know where to pay. Do we pay at the ranger station? You should be able to pay at the ranger station on Koh Adang. Let us know how it goes. Are there longtail boats available to take you back from Koh Adang to Koh Lipe or would you recommend getting your initial drivers number and having a SIM card? Typically during the day the longtails boats come and go between Koh Adang and Koh Lipe. However, it would be good to grab your drivers number just in case. We called our previous driver about 15 minutes before we wanted to be picked up, that way we wouldn’t have to wait. Hi, do you know if there is a boat that goes to Koh Adang directly from Satun mainland? I don’t plan on visiting Lipe at all. Thanks! Sort of but you are still going to have to book a ferry to Lipe, there isn’t a dock for larger boats on Koh Adang and the demand isn’t high enough. Your best bet is taking the ferry to Lipe and then when you are on the platform where the larger ferries drop people off at Koh Lipe, instead of taking the longtail from the platform to Lipe you should be able to arrange a longtail driver to take you to Koh Adang. This would avoid having to ever go Lipe, if that’s what you want. We have been looking at The Reef which is fairly cheap at 400GBP for 7nts arriving 27th Dec.
We looked at a few of your recommendations but a lot were booked up or just a bit over what we want to pay – albeit we are happy to go to about 650GBP give or take. The Bundhaya Resort looked good, and was about 700GBP however The Reef looked a bit fresher and although away from the beach (cc5min walk) the 300 saving seems worth the 5 min walk. Have you any experience/knowledge of The Reef? We are in Singapore for Christmas but I will look into the mandatory dinner in any case. The more I read and see, I think Koh Lipe perhaps has the right amount of things to see and do together with some chill time for us given we are in Singapore for 4nts before and travel to Kuala Lumpur for 3nts after. Your blog is fairly comprehensive and informative, if you have any other points to note or info I’d greatly appreciate that. Hi Julieann, sorry for the delayed response. We have never stayed at The Reef, but have walked by many times. It seems to have been updated when we were there in December. The location is decent if you don’t mind being off of the beach, it is actually closer to most restaurants than staying on Sunrise beach by a few steps. Bundhaya is one of the original resorts on the island and also looks nicely cared for. This one is on Pattaya Beach which is a nice deep beach, but has more boat traffic during the day. Personally, I would rather be one the beach and choose Bunhdaya. Plus I wouldn’t put the reef and Bundhaya on the same level of places, Bundhaya seems much nicer, if the price is close there is no contest. If something changes or opens up our favorite beach is still Sunrise Beach, but it’s a busy time of the year so options are limited. If you are coming to or from Malayasia or singapore you can also come to Koh Lipe from Penang via Langkawi to add other destinations. Langkawi is alright, but I’d rather give more time to Koh Lipe. Penang has more culture and interesting points and is worth a visit if you have the time. We are planning to be in ko lipe over new years this year. Would you recommend for this time of Year? Honeymoon couple looking for some nightlife but nothing too wild! If you are going over the holidays just note that some hotels have mandatory dinners on Christmas (not sure on NYE), well at least this was the case on a different Thailand island over Christmas in 2013. Thailand has some nightlife and more chill beach bars. What Koh Lipe hotels are you looking at booking? Hi! Do you know if Koh Adang is accessible from Koh Lipe in late May? I read Koh Tarutao is closing May 16th. I will be in Koh Lipe May 17-about 21st, and am really hoping to be able to go to Adang while there! Thanks. Also, I tried to use your AirB&B link on the Koh Lipe post, but it would not work (made me log in first, and then would not load the correct page). Love your site! I am not 100% sure but I would think it is as it is super close. The Airbnb link is for first-time users credit, if you have an account you’d have to signup for another account to get the credit. 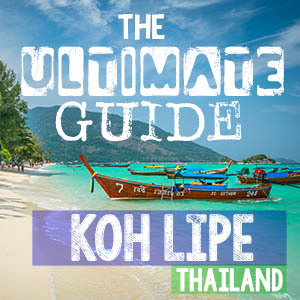 Let us know if you have any other Koh Lipe or Koh Adang questions. Hi guys! How did you arrive to Koh Adang? They seem just amazing and not overcrowded at all! We planned to stay around Ao Nang- Railay (as we only have a couple of days), but may be we decide to go a bit further. What would you suggest if we are looking for a quite amazing island? You can take a longtail boat from Koh Lipe for only 100 baht ($3) a person, it’s only 10 minutes away. You can take a ferry from Krabi to Koh Lipe as well. I would head to Koh Lipe and if you want even more quiet then Koh Adang. Let us know if you have any other questions. Nina - Where in the World is Nina? Uhhhh! I’m already upset that I still haven’t been to Lipe, now you guys show me this?! Haha. There are just too many Thai islands to take in. Waterfalls, snorkeling and adventurous hikes is def my type of island tho, must.go! Sorry! Yes there are so many Thai islands to visit, you could spend years traveling Thailand and still not cover it all. Make sure to put Koh Lipe & Koh Adang on your bucket list for next time.